Happy Easter! Finding hidden eggs is one of the fun parts of the holiday. Hunt your favorite element with this Easter Egg Hunt on the Easter periodic table wallpaper. Each dyed egg contains the element’s atomic number, symbol, name, and atomic mass. The different egg colors represent different element groups. Click the image to view the full-sized table at 1920×1080 resolution or download it directly. This image is suitable for a wallpaper any widescreen HD device. 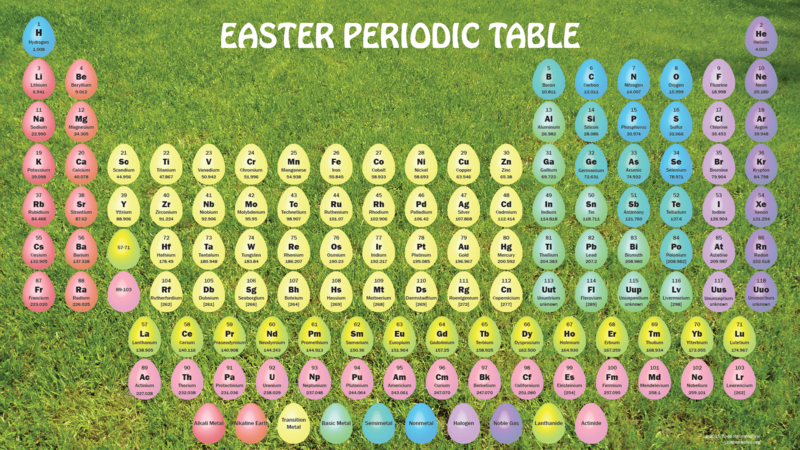 This periodic table wallpaper is an updated version of the Easter Egg Periodic Table. It includes the newer elements added since the original table came out along with one or two changes to atomic masses. If you are looking for the original version of this wallpaper, here you go.